Generally, there are two models to value CDS. Probability model is based on hazard rates and no-arbitrage model assumes that there is no risk free arbitrage. The latter model was developed by both Duffie and Hull – White. Duffie uses the LIBOR as the risk free rate, whereas Hull and White use US Treasuries as the risk free rate. 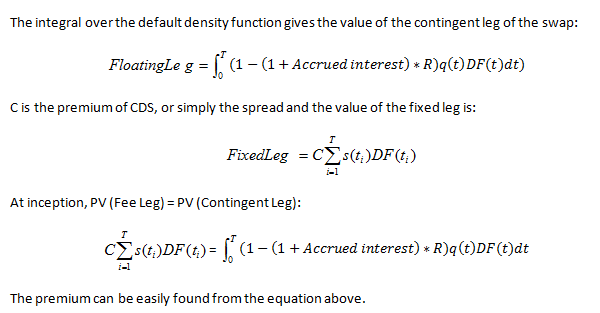 Instead of using hazard rates as a conditional probability of default, the model incorporates the unconditional cumulative default probability and assumes that default rates, recovery rates, and interest rates are independent and that there is no counterparty risk. 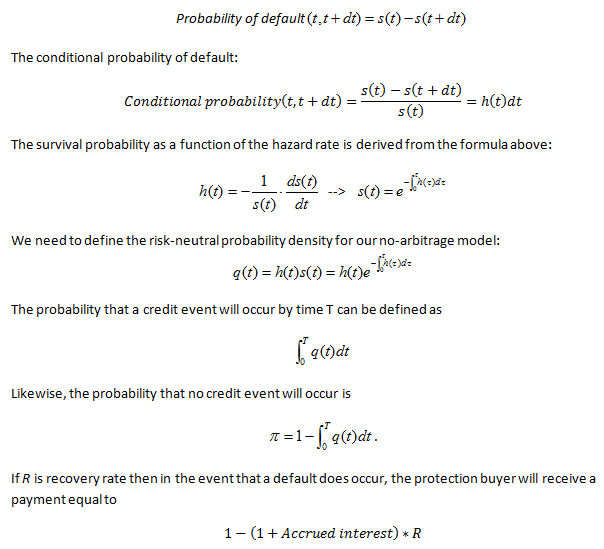 The unconditional probabilities are the probabilities of default in a given years as viewed from time zero. For example, the unconditional probability of default during year T is equal to the difference in the cumulative probability in year T minus the cumulative probability in year T-1. Example: Value a 1-year CDS with quarterly payments taking into account credit spread is 50 bp., recovery rate R is 40% and notional amount is $10 million. By default, we assume the value of the accrued quarterly premium payment if a default occurs is a half of Premium/4 . This means that default can happen in the middle of the quarter. The fixed leg is greater than the floating leg. This is a valuable transaction for the CDS seller, with a positive CDS value to the protection seller. The protection buyer pays 50 bp. for the CDS but in reality the price should be around 32.097 bp. so the PV of fixed payments is equal PV of floating payments. The calculations are attached in the Excel file.